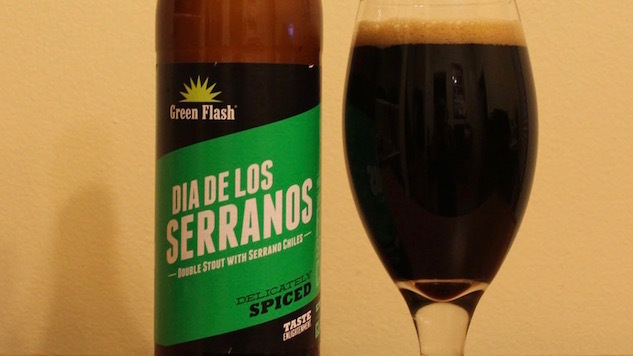 Finding a straight-up style release from Green Flash is uncommon, well evidenced with the new Dia de Los Serranos, a double stout that was inspired by Mexican mole recipes, packaged in 22 oz. bombers and delivering an 8.8% ABV. Despite the big and bold bottle, spicy concept and double stout categorization, Dia defies its bold appearance and plays out as a more mild-mannered brew. The beer pours jet black with a pretty brown head. It’s aromatic: nutty with a touch of acidic pepper and just a hint of chocolate that smooths it all out. Passing from smell to taste, it follows that same profile. There’s some bitter coffee that first hits the taste buds and transitions to a soft chocolate before it eases up with a mild pepper, more green and acidic than hot. It’s a soft stout with a high carbonation level, and that effervescence accents the spice behind it. Instead of a domineering burn, the heat is soft and smooth with a complementary zip. Much of the flavor of this stout comes at the tail, where the smooth chocolate and bitter coffee meet in the middle, interplaying for a clean and surprisingly clean finish. On the first impression, Dia de Los Serranos is mild and understated, but the larger bottle is fitting for how the beer sits with your palate, developing deeper flavors as it warms above fridge temperature and letting the different profiles interact on the tongue, ultimately using the pepper as accent where so many other pepper beers use it as a spicy gimmick. Loren Green is a Minneapolis writer covering beer, music, and all kinds of fun. Follow him on Twitter at @lorenmgreen.